Agile software development has 12 principles. Agile application is the result of Service Oriented Architecture (SOA) and Agile development. Lot of terminologies. Software Oriented Architecture (SOA) was explained before and also we explained the relationship of Software Oriented Architecture (SOA) and Cloud Computing. Now, we need to combine Agile Application and Cloud Computing for explanation. Obviously, this guide is not intended for a masters’ degree holder in software engineering. The purpose is explaining the theoretical part, which basically needed for practical works. People hugely searches for finding the meaning of Agile Cloud Computing. We guess, explanation of the concept of Agile software development will work better for understanding from the origin. As we said at the beginning, Agile application is the result of Service Oriented Architecture (SOA) and Agile development. There is “The Agile Manifesto”. Practically, the phrases are confusing than explanatory. 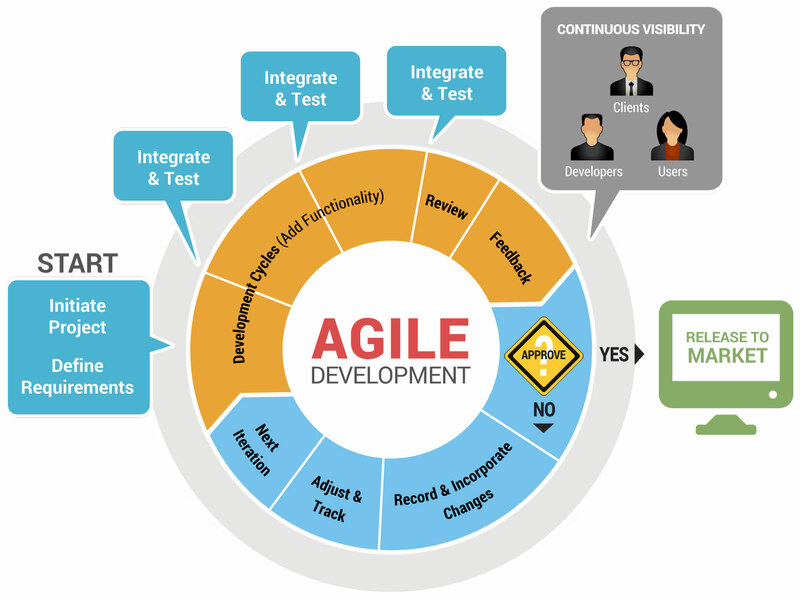 Agile software development refers to the engineering methods based iterative and incremental software development, where requirements and solutions evolve through collaboration between self-organizing and multidisciplinary groups. There are many agile development methods; most minimize the risk (of failure) by developing software in short increment. The software developed in a unit of time is called an iteration, which should last from one to four weeks. You’ll find books, articles with title “Iteration – Guide to Agile Practices”. Each iteration of the life cycle includes planning, requirement analysis, design, coding, and documentation review. An iteration may not add too much functionality to justify the release of the product to the market, but the goal is to have a “demo” (without errors) at the end of each iteration. At the end of each iteration, the team reevaluates project priorities. Agile methods emphasize face-to-face communication rather than documentation. Most agile teams are located in a single office. Agile methods also emphasize that the functional software is the primary measure of progress. Combined with the preference for face-to-face communication, agile methods generally are criticized and treated as “unruly” by the lack of technical documentation. Now, think in a different way. The basic reason why the newly recruited software engineers feels huge pain, is for the basic fact – most of the outsourcing companies hires them; suppose, we ordered to develop a custom software for our Law Farm to IBM’s one department. They’ll chop the whole process in to pieces of work for abstraction. Work will be given to the outsourcing companies. Software development, practically can not be done giving pressure. We code lightly as amusement as hobbyists. The name of IBM is just used for example, there are lot of derivatives like Lean Software Development (LSD), Agile Unified Process (AUP), Dynamic systems development method (DSDM) and so on. These are agile methods of software development. The reason to explain you in this way is for removal of observational bias – WordPress development or an Open Source Project in GitHub are not only the examples of Agile Application Development. An Agile Application is distinguished from average applications – Agile Application is a loosely coupled set of services with a decoupled orchestration layer and it is easily modified to address changing business needs and it is scalable by design. Agile is a means of responsiveness based on customization rather than stable production or standardization. IBM or Intel has tools. The basic reason why they have tools is the story we wrote to think in a different way. There will be relationship with Swarm Intelligence. As the things are science, the logic will meet at one point. We guess, the heavy words became lighter for understanding. So, what the relationship Agile Application and Cloud Computing can have for that the key phrases are so much costly for advertisement? Because, the statement – “Agile Development Meets Cloud Computing” is valid; but also the statement “Cloud Computing Affects Agile Practices” – is also valid. In the Could Computing related works, you’ll find another word – DevOps. DevOps is combination of two words – development and operations. Among DevOps, you’ll find a point in typical description – “Use of agile and other development processes and methodologies”. Rackspace has DevOps service (5K USD per month minimum charge), Senior Linux DevOps Engineer is paid almost double than Linux Systems Administrator. This Article Has Been Shared 4737 Times! Cloud Based Mobile App Development can be coded easily for the back-end. It is the Front-end which creates confusion to many. Junior is front-end framework. Points to Consider While Switching to Cloud Computing should be given importance for both web applications and enterprise applications, simply to save money. Hybrid Cloud is the Future Not Public Cloud, Because Control and Privacy of Data Becoming a Major Concern to the Corporate Sector and Medium Sized Companies. Relationship of geographic location of Data Centers and network latency is always one of the features which is taken into account while operating in different countries. Cite this article as: Abhishek Ghosh, "Agile Application and Cloud Computing," in The Customize Windows, November 6, 2014, April 21, 2019, https://thecustomizewindows.com/2014/11/agile-application-cloud-computing/.